Behavior Charts! Get your kids eating right with some of our healthy eating behavior charts! Do you have picky eaters in your home? 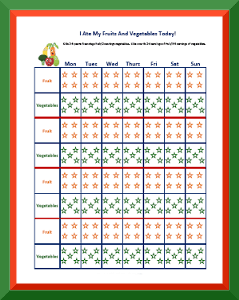 Help encourage healthy eating habits with our printable behavior charts. Whether it's tracking fruits and vegetables or cutting down on soda, we have a chart that should work for you! We also have a great article if you have a toddler who is a picky eater! And if you have an older child who is a picky eater, read Parenting Picky Eaters!